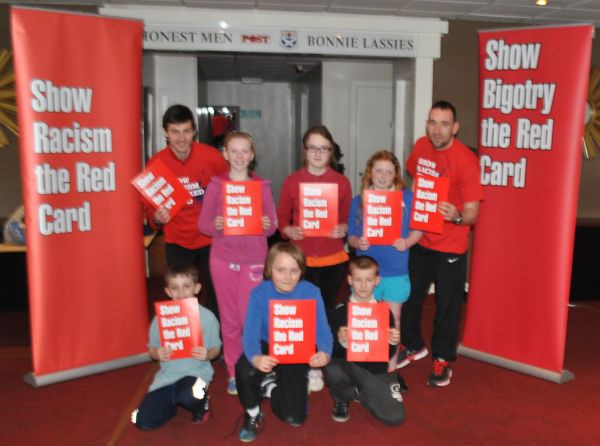 Show Racism the Red Card were proud to work with Ayr United FC to offer an educational event for pupils of St John’s Primary School on Wednesday 12th March. Show Racism the Red Card were proud to work with Ayr United FC to offer an educational event for pupils of St John’s Primary School on Wednesday 12th March. The event, funded by Scottish Government’s Equality Unit saw the pupils come to Somerset Park for a day of workshops promoting messages of equality and respect and a chance to train on the pitch with members of the Football Academy coaching staff. Guests on the day included first team Ayr United players, Michael Moffat and Michael Donald, ex-professionals and Show Racism the Red Card coaches Michael Weir and Robbie Winters. The guests spoke about their experiences of racism and offered advice on how to deal with, and combat, racism whenever it occurs.